Is Grandma looking for Joan on Whittaker St in Sudbury - ParaNorthern - YOUR Stories of strange, unexplained and scary events. My story relates to the house I lived in with my husband here in Sudbury Ontario. I moved into the house in 2008 and was thrilled to be living in a 'house of my own'. I no longer felt that same happiness when I realized that we were sharing the house with the former owner's dead grandparents. The energy in the house was subtle. I ignored it at first and believed that it was just residual and normal for any old house. The house was oddly quiet and it made staying there very uncomfortable, even during the daytime. As the first year passed I did a lot of renovations and that seemed to "strip" some of the past energy away. Then one day when I was in the upstairs bedroom I had the sudden urge to look out the window. Beyond the backyard there was the Eyre cemetery that was separated from our house only by a lane-way. I thought I saw a movement there among the tombstones when I heard a voice call out from behind me, "JOAN!" The voice was female and very clear. It rang out through the upstairs and I immediately felt a wave a nausea. Of course, there was no one there in the house but me. We only stayed there 3 years as a couple. In that time I saw the woman exactly 4 times and a man I believe to be her husband once standing outside our bedroom door. I would often have dreams of there being things under the floorboards or hidden away. I even felt that the woman "lead" me to find an old skeleton key someone had left on top of the tool shelf in the basement. The key fit the bedroom upstairs that was particularly icy and sensitive. One of the occasions that I felt the woman was when I was preparing things for my first child. I felt her presence and knew that she was watching. I said, "I know you're happy for me. Do you like children?" It was almost like she was surprised I was speaking to her and immediately was gone. I never saw or heard her again. Overtime I got used to the uncomfortable feelings and the odd happenings around the house like movement past the doors, the sound of pressure on the T.V. power button as it clicked off randomly. I felt the house was haunted but didn't know what to do about it. My feelings were confirmed when my husband registered at the hospital and the intake nurse read out his address. "(address removed) Whittaker? I used to live there! My grandparents owned it. My grandma had dementia near the end and hid things around the house. If you find anything it's yours!" she laughed. The nurse's name was Joan. There are many old houses in the West End of Sudbury, Ontario. Casual walks up and down the areas few remaining alleyways show even the most indifferent of observer that this area was once an active business and residential hub. Remains of livery stables, warehouses and other businesses are evident everywhere. 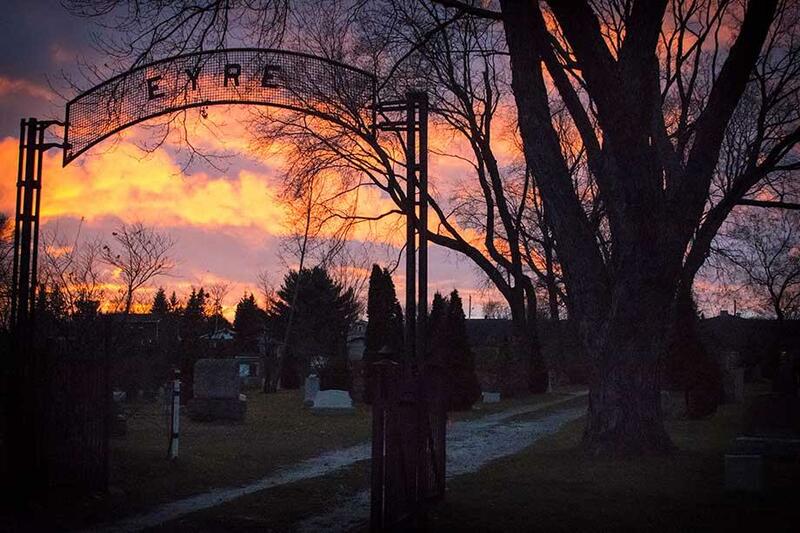 The Eyre Street Cemetery is among the oldest official burial sites in the region. Many people have reported seeing and hearing strange events in this area. Poltergeist, or noisy ghost activity can be playful or malicious, but they involve objects moving, disruptive noises and interference with electronic devises. Demonic events are far more disruptive are often intended to frighten and breakdown a person's will. Residual hauntings are considered to be replays of past events. They're usually very emotional happenings like a sudden death, attack or other serious event. It's like the place it occurs in has recorded the event. Based on her description of events, this is not what Sarah May claims to have experienced. What she seems to have encountered is classified as an intelligent haunting. According to the website, The Occult Blogger "An intelligent haunting is when a spirit or ghost wants to be noticed and has an intelligence about it. A good example of an intelligent haunting is when a spirit or ghost wishes to communicate and patterns form where it indicates interaction in this time." It would seem that Joan wanted to be remembered.